This book provides a range of sky-faring vessels, creatures that can fly and feats and magic items suitable for airborne use. 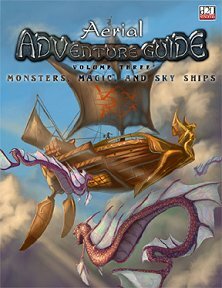 Publisher's blurb: "Monsters, Magic, & Sky Ships is the third volume in the Aerial Adventure Guide series. It introduces a wide array of new crunchy bits for your aerial campaign, including 11 new monsters, several dozen new magic items, and stats for new kinds of sky ships: autogyros, sky fortresses, zeppelins, villageships, and more."